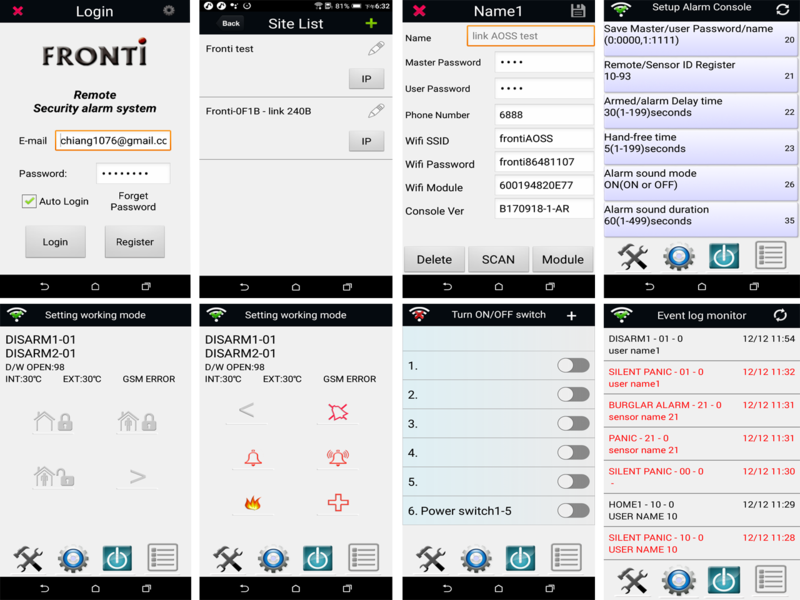 Wi-Fi/IOT Cloud server, that APP can any time & anywhere on-line working with alarm console. 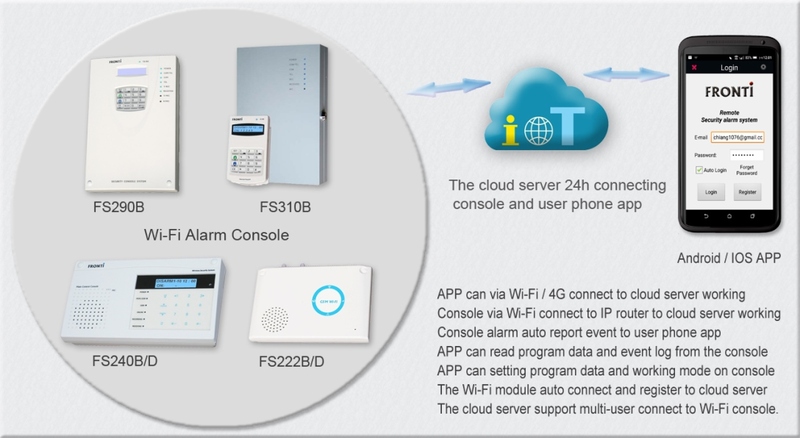 The alarm console Wi-Fi will via IP router 24H connect to cloud server, so user phone APP can via 3G/4G/5G or Wi-Fi login server e-mail/password user account to connect alarm console working. User can on APP via cloud server on anytime and anywhere working with Wi-Fi console. The APP can install on Android/iOS system working that can select IP or GSM SMS mode. The GSM SMS mode is via SMS text data 2-way connect working. The APP will on local IP router scan the Wi-Fi module then register to cloud server. The console Wi-Fi module will auto detector disconnect to report event log. The cloud server support IOS/Android system 24H working. The cloud server support multi-user APP connects to Wi-Fi console. The APP register e-mail account /password on Cloud server then can scan the Wi-Fi module. The APP can set to save program data and read all program data on the console. It can operate all working mode and control AC power switch turning on/off. The APP can read event 250log from the console. It also can trigger alarm on the alarm console. When received event will emit sounds to note user to view the event. It supports multi-language by system local language. The APP and alarm console communication by cloud server to protect security. It can set user / installer or both of account to setting the alarm console. Login page: The APP has to e-mail account and password register to server for security manager. Site page: The app can pre-set multi console code data and save console data that can select to control different alarm console working. Name page: It can pre-set the console connect code data and save console data. It can set the Wi-Fi module register to server on local IP router network. Setup alarm console page: It can set the console all program data and re-flash to read the program data on the console. Setting working mode1: It can set the console working mode on Disarm/Home/Away armed. Also it can show the console working stats. Setting working mode2: It can active the 5kinds of alarm on stop alarm/Silent panic/Panic/Five andMedical help. Turn ON/OFF switch page: It can set the console 5 groups AC power switch ON/OFF and show stats. The each channel group can by user define the AC power switch name. Event log monitor page: It can show the console all event log list that can re-flash update new event log. Three-color LED smog generator will display situation when triggered. Smog generator will emit warning buzzer to show system fault condition.